Obviously my handstitching is not very good before 8:00 am. Having my sewing stuff spread out between three different places is inconvenient for many reasons (although it’s helpful for minimizing the appearance of how much actual stuff there actually is…). Not least of which, I only had one pin cushion (the darling little mousie I won from 3 Hours Past yonks ago), which obviously can only live at one place at a time. At home, I was making do with a little stuffed eyeball originally made for a kid’s class project. Despite being satisfyingly quirky/creepy, especially when stuck full of pins, the eyeball has two drawbacks as a pin cushion. It’s pretty tiny, first off, so the number of pins it can comfortably house is small, but worse, some combination of the fabric it’s made with and the fabric it’s stuffed with make it quite hard to shove pins into. Not ideal. So when I wanted to use some of the new glass-headed silk pins (It’s also Steph’s fault that I’m completely addicted to these now, by the way) I picked up at the local fabric store’s New Years sale, I needed someplace a bit more spacious to put them. This black and yellow cotton is from a small piece of stuff my Grandma gave me a while back. I like the idea of having that as a pincushion I’ll use for ages and ages. In fact, the only thing I’m regretting is not hunting down some sawdust for a proper stuffing. But Steph’s mousie has just regular stuffing, too, and has held up just fine—the nicest thing about the sawdust is it’s heavier, so doesn’t skitter away when you try to poke a pin in it. And I’m pretty sure I wouldn’t’ve been able to find stuffing before 8:00 am. All of which is a LOT more than I planned to write about a silly little pin-cushion. It’s also good for seam rolls and tailor’s hams! …apparently. Oh, that eyeball is precious! But I see how the other might be more practical. Haha I love the eyeball! Especially with the addition of pins. Your kids are hilariously quirky! I like your new pincushion too. I really need to make myself one. I have a wrist pin-cushion that I won from one of Patty’s giveaways, and I love it. It’s handy because it’s with me wherever I go (sometimes even to the kitchen for dinner). But it’s nice to have a stationary pin cushion too, and I’ve had piles of pins on my desk before because of a lack of cushion. *BADUMDUMTISS* I’ll be here all week. What a great use for sentimental fabric. I am rather partial to that eyeball, but I can see the limited functionality of being too small, too light and not stabable. 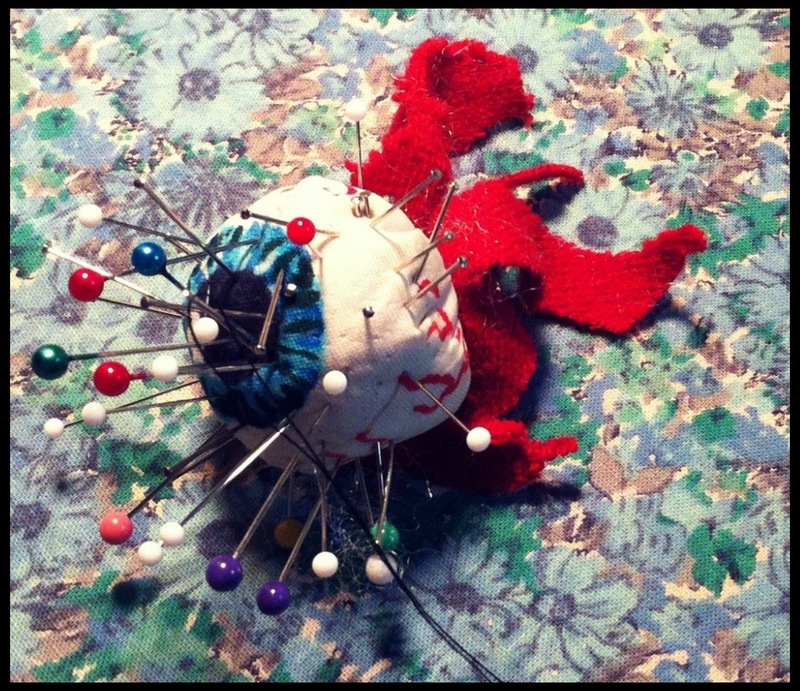 That eyeball is probably the awesomest pincushion I’ve ever seen. Maybe you could make a larger one and stuff it with sawdust for a more purposeful creepy pincushion? I second that! And that glass headed silk pins are *the BEST*! Love the new pincushion, and that eyeball is TOTALLY CREEPY! I’m utterly amazed you did any stitching before 8am (on a Saturday) that wasn’t a dance costume required for performance that day. Or something. 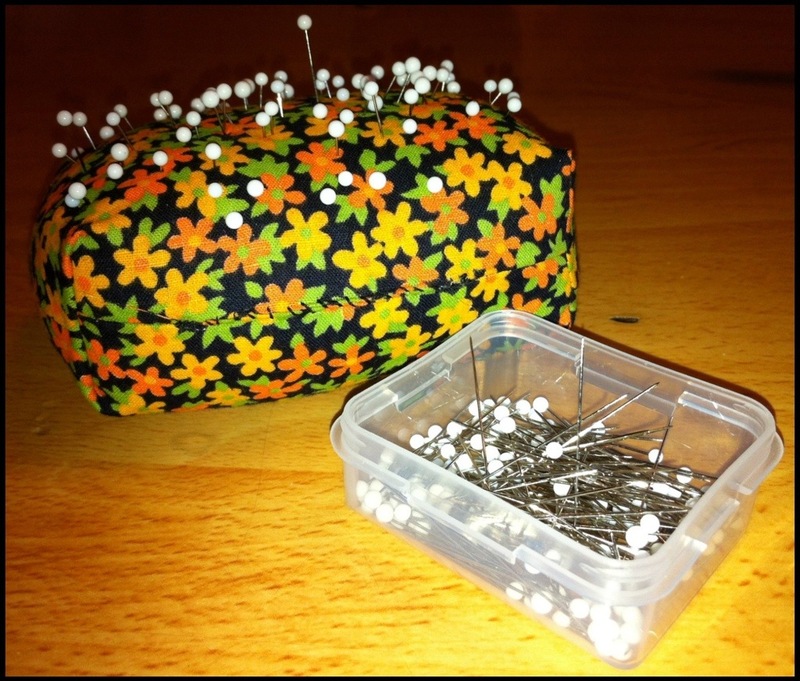 Good idea to make a new pin cushion …. I need me one too. PS really? Sawdust? Who’d’ve thought!